When you first try to connect to the XR700’s Web interface, you’re met with a wizard process that leads you through terms and conditions, choosing which port the WAN is connected to, then Internet autodetection and speed analysis, although we found the upload speed couldn’t be detected properly. 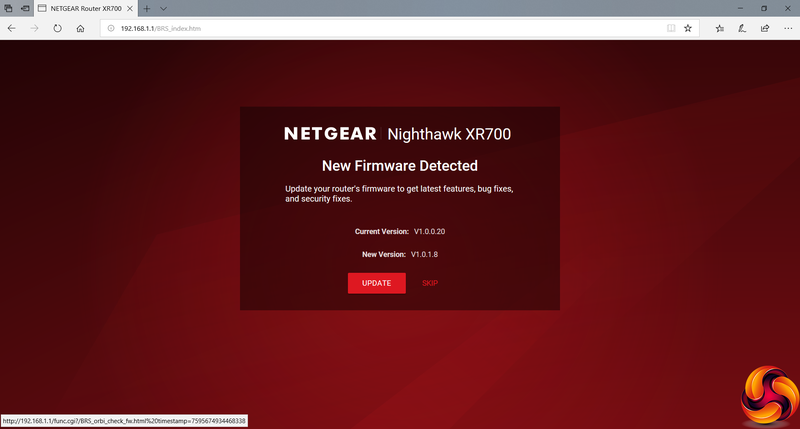 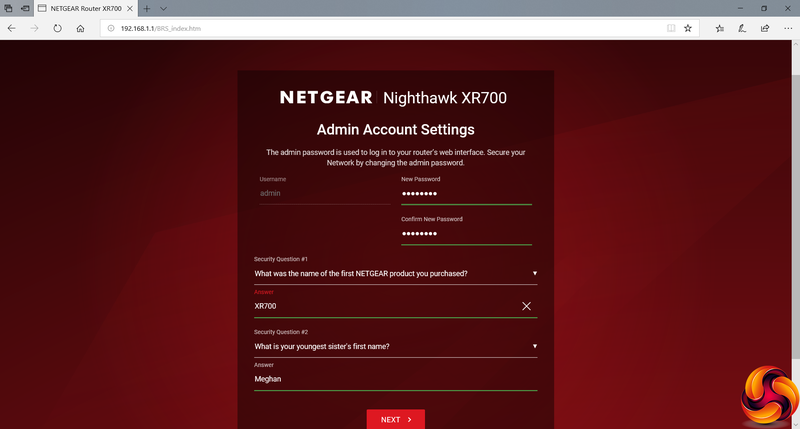 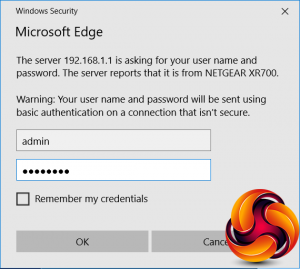 Next, you’re prompted to set up the admin password and WiFi name, followed by updating the firmware to the latest version and registering your product with NETGEAR. 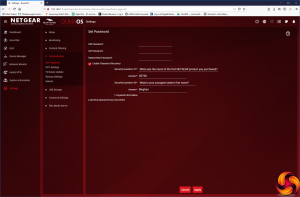 Finally, it’s time to log into the administration interface proper. 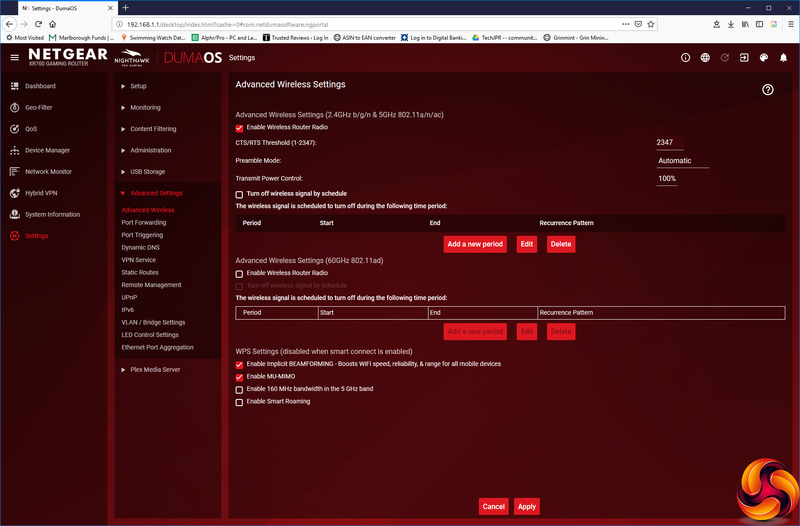 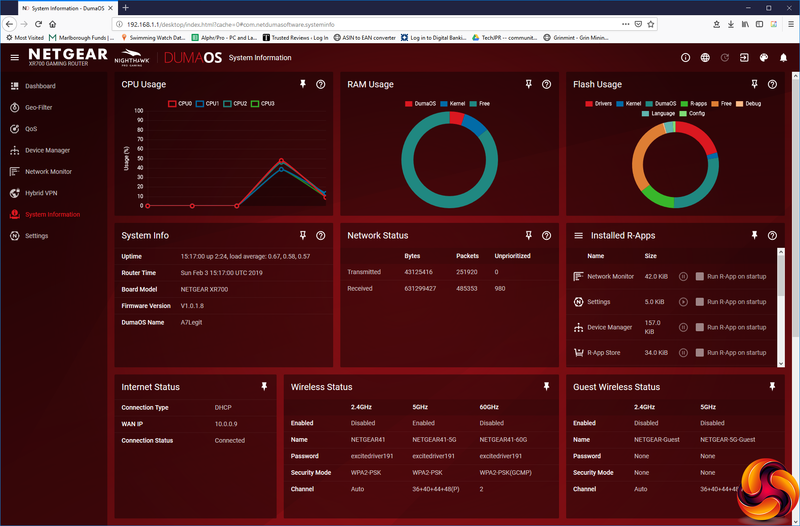 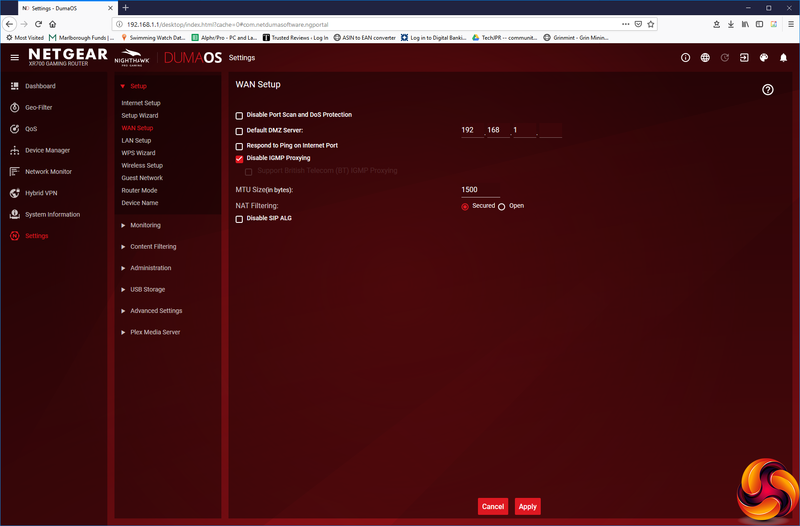 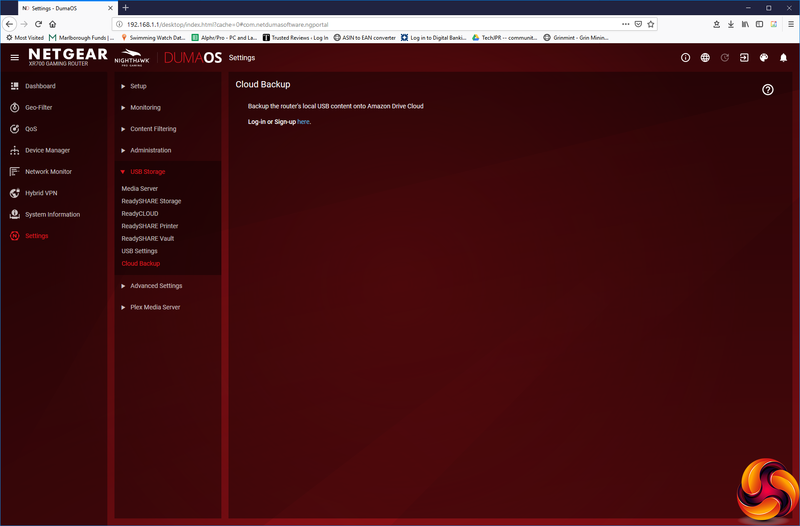 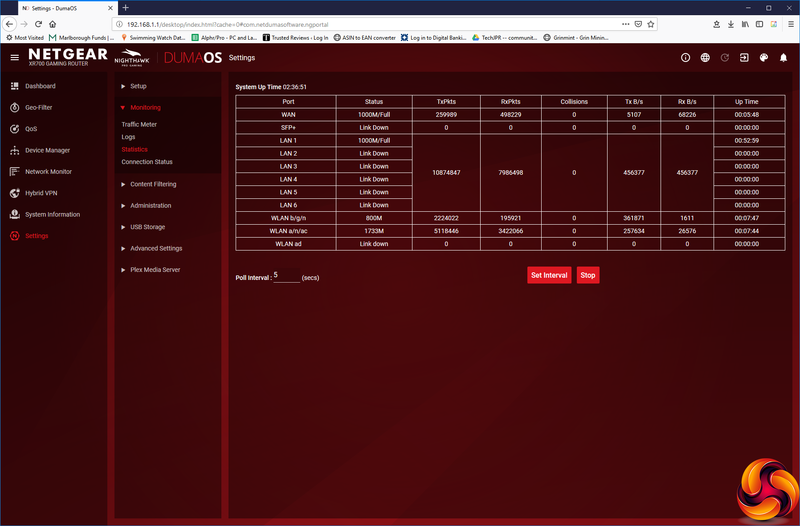 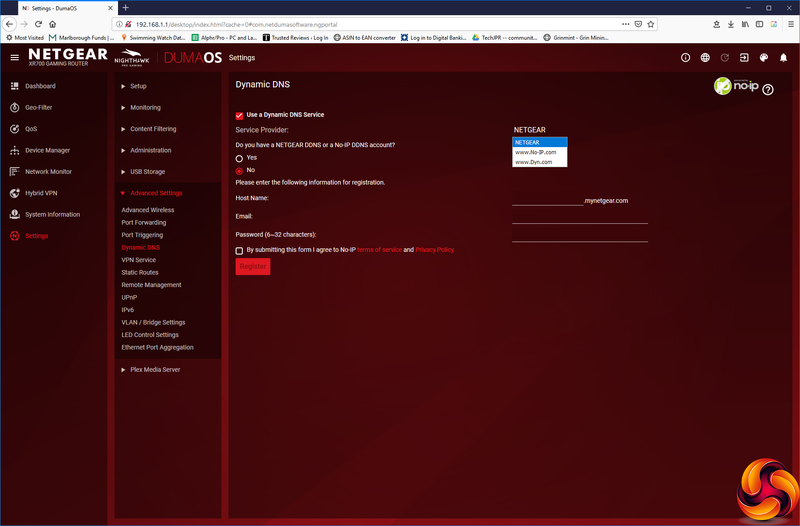 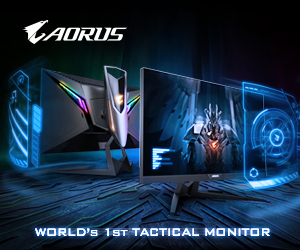 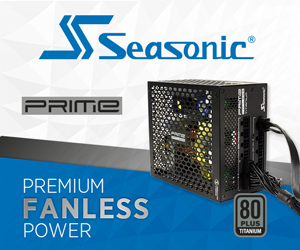 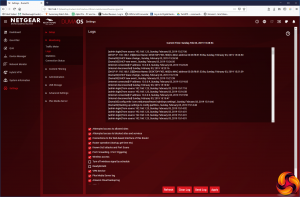 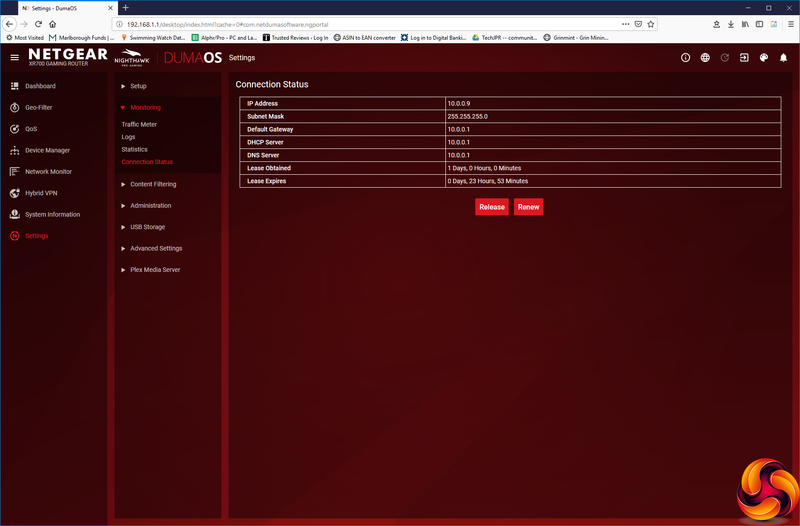 The front end of this is DumaOS, a networking application specifically designed to optimise your gaming experience. 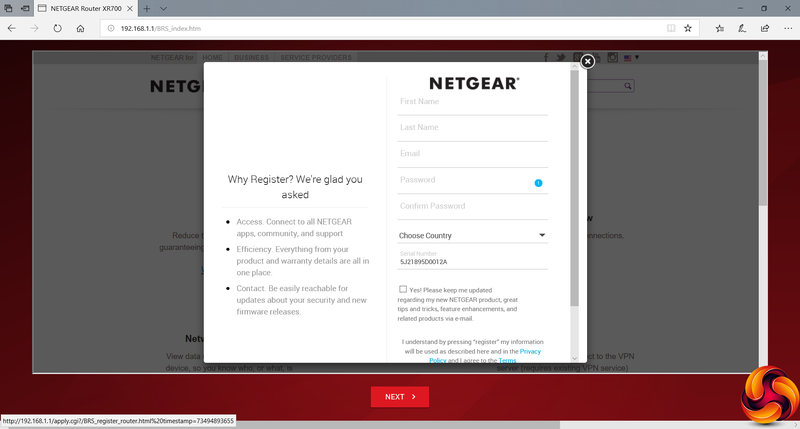 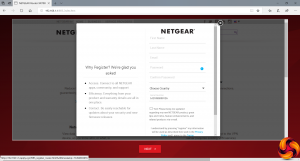 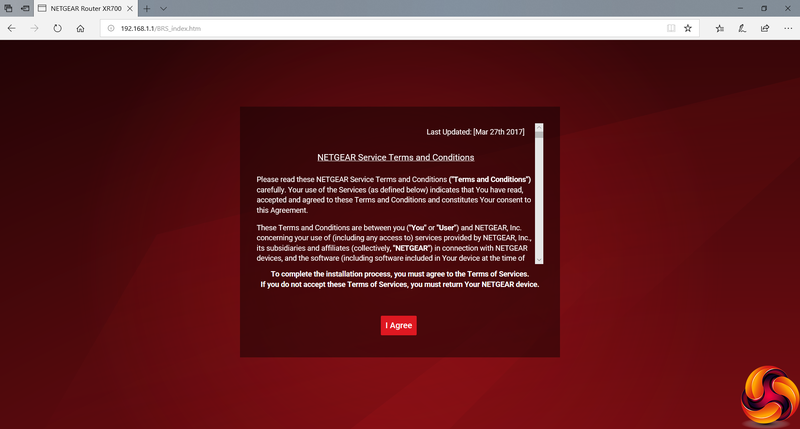 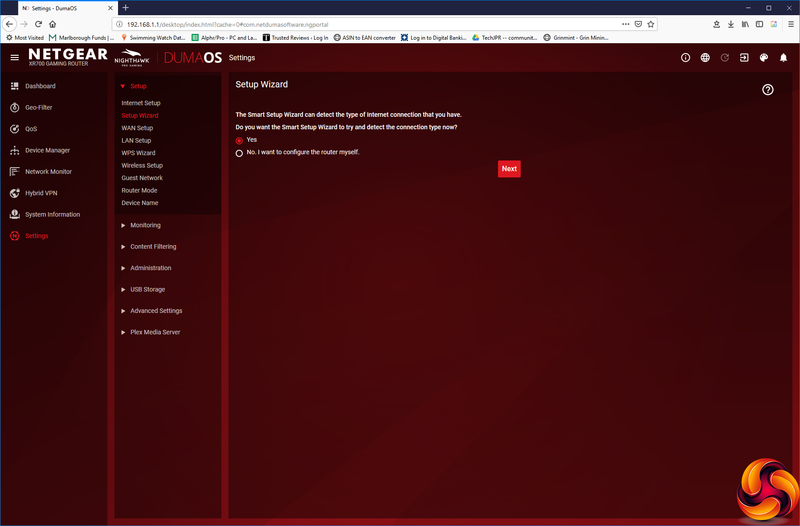 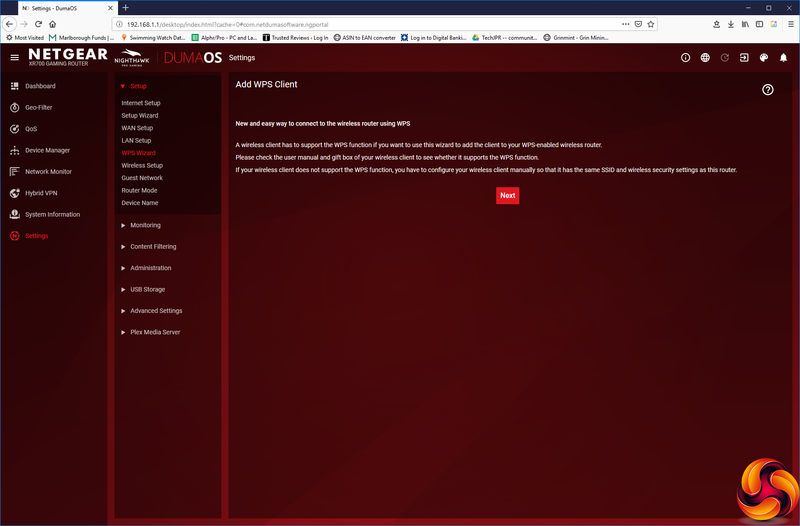 This essentially sits on top of the traditional NETGEAR interface, although the latter has also had a makeover to have the same dark red appearance, white text and font style. The initial Dashboard screen shows you headline information about the router’s performance. 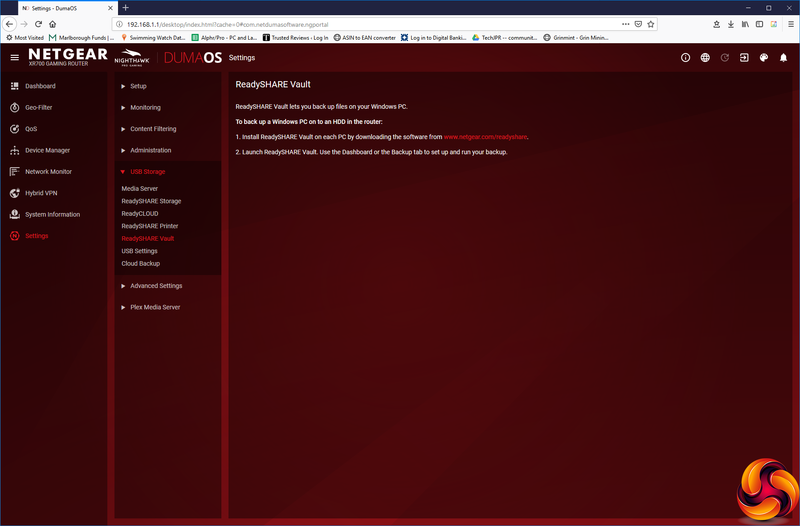 The first DumaOS goodie is the GeoFilter, which allows you to limit your servers for specific games to within a specific area from your current location. 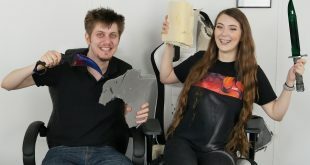 This will mean that you can’t see or connect to servers so distant that your playing experience will be compromised. Next up is the Quality of Service (QoS) section, where you can limit individual clients to a fair share of the Internet bandwidth, or give some more than others (such as your internal game server). 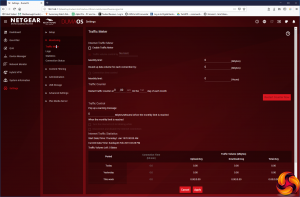 You can also prioritise traffic for particular game titles and specific client devices. 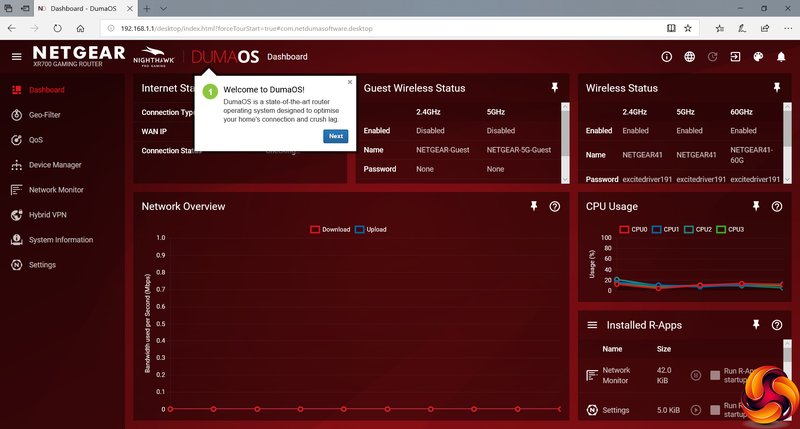 The Device Manager lets you explore the clients attached to the network, give them permanent IP addresses, and block them if you want. 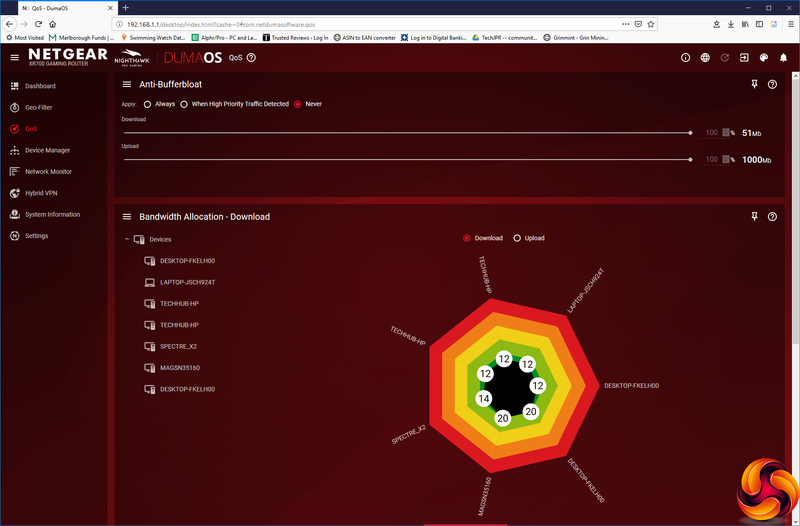 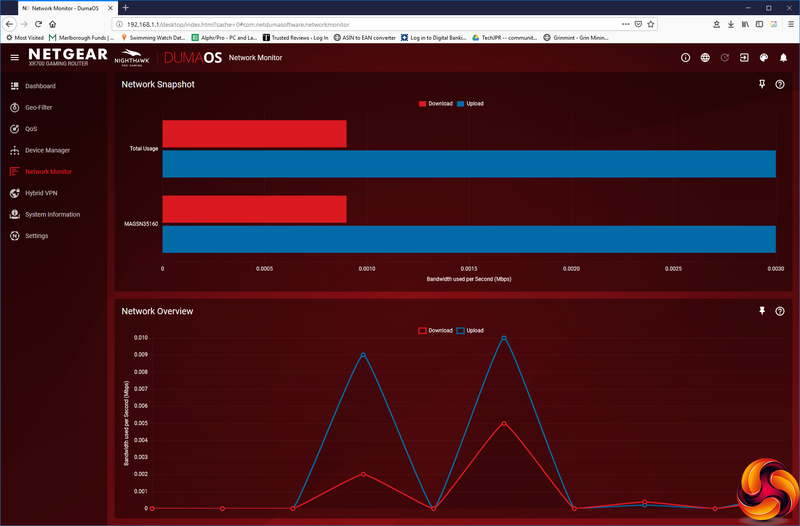 The Network Monitor lets you explore how much bandwidth each client device is currently using. Finally we come to a feature that the Nighthawk XR500 doesn’t have – Hybrid VPN. 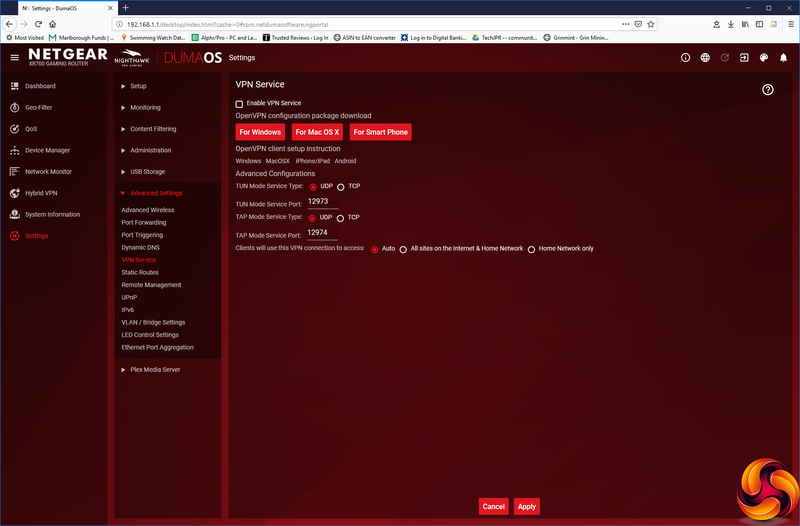 This lets you set up a VPN connection that only applies to a specific game from a particular client device. The benefit of this is that the people you play with won’t be able to see your IP address, so won’t be able to get you banned by IP or mess with your enjoyment in other malicious ways. 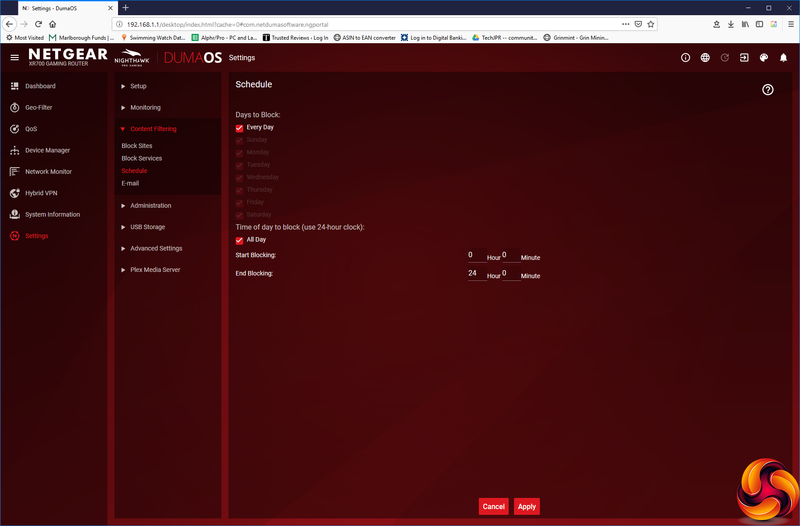 The final piece of the DumaOS puzzle is a more detailed System Information screen. 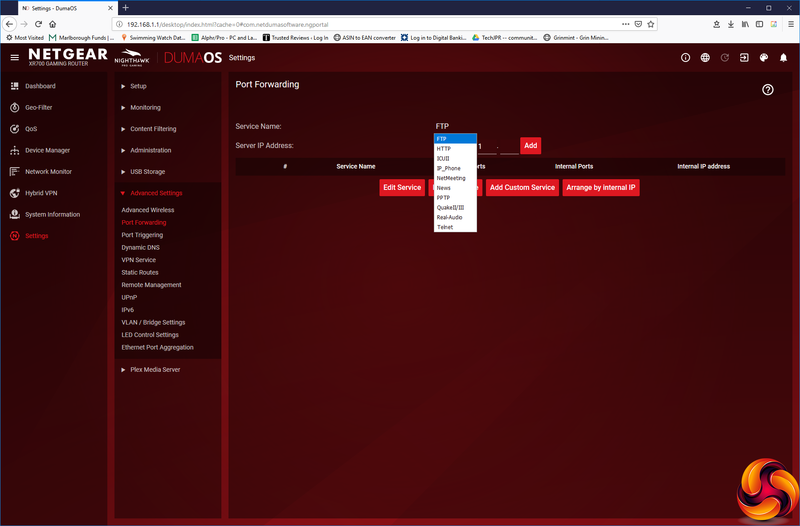 Hidden behind the Settings option on the left is a whole additional management interface with a plethora of further parameters to play with. 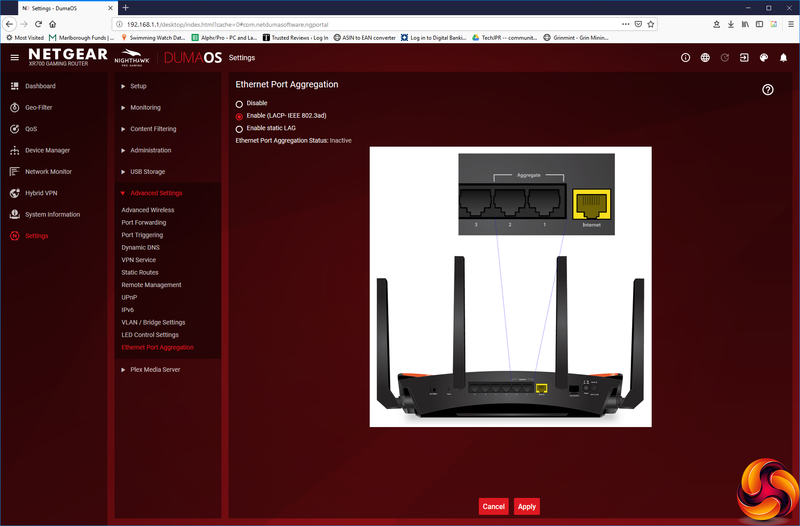 The Setup section lets you reconfigure your Internet connection or go through the original Setup Wizard again. You can change WAN and LAN IP settings and other options. You can add a WPS client (although the button on the router itself will be quicker). 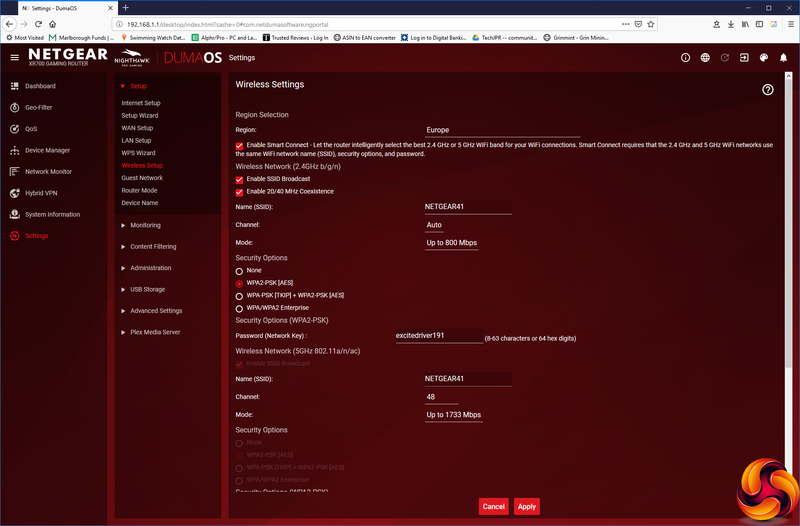 You can configure the WiFi, including channel usage and bandwidth. 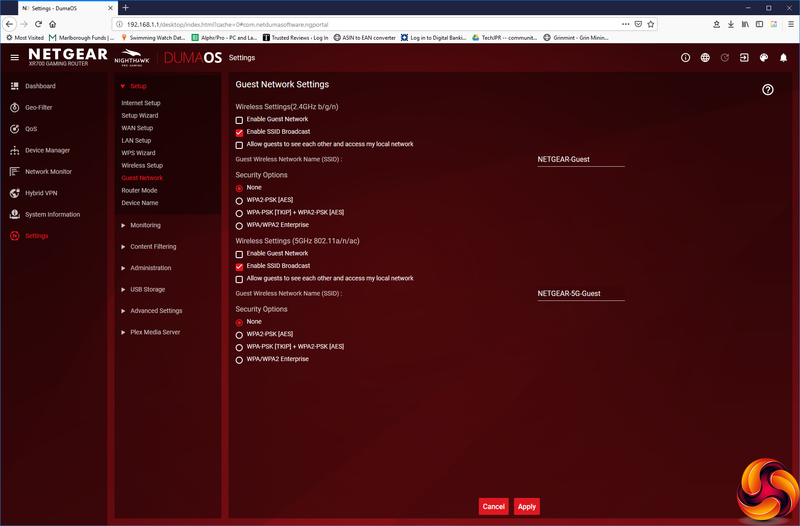 A handy option here is to use the same SSID across the 2.4GHz and 5GHz radios, then enable Smart Connect, which allows the client to be switched dynamically to whichever WiFi type is currently offering the best signal. You can also toggle the XR700 between router and access point modes, and change its device name. There’s another Monitoring section to be found here, which lets you see statistics and limit data usage if you have a capped Internet connection. 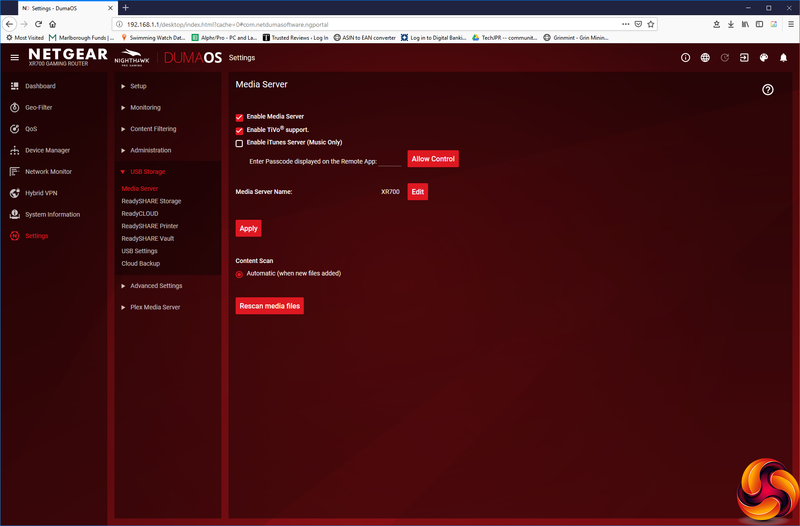 You can view the system log and toggle what gets recorded. 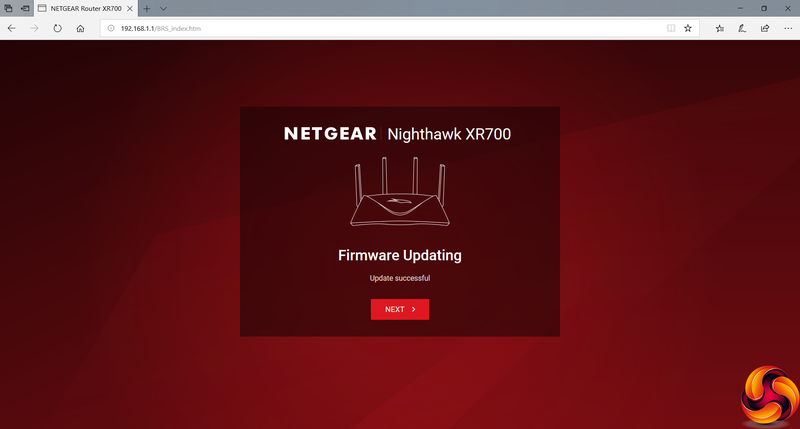 You can see numerical details of how the WiFi and wired ports are being used, and an overall readout of the Internet connection status. 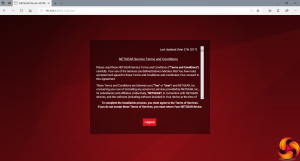 The Content Filtering section lets you block access to specific websites or domains by keyword, and specific network services. 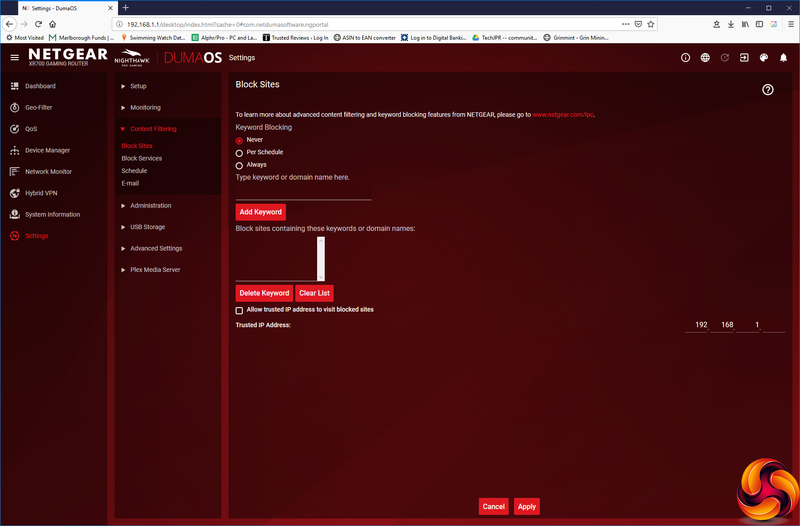 You can schedule when the filters will be applied, and define an email address to receive notifications of attempts to access blocked sites and services. The admin section provides the ability to change the admin password, configure the time server, update the firmware, backup settings and reboot the system. 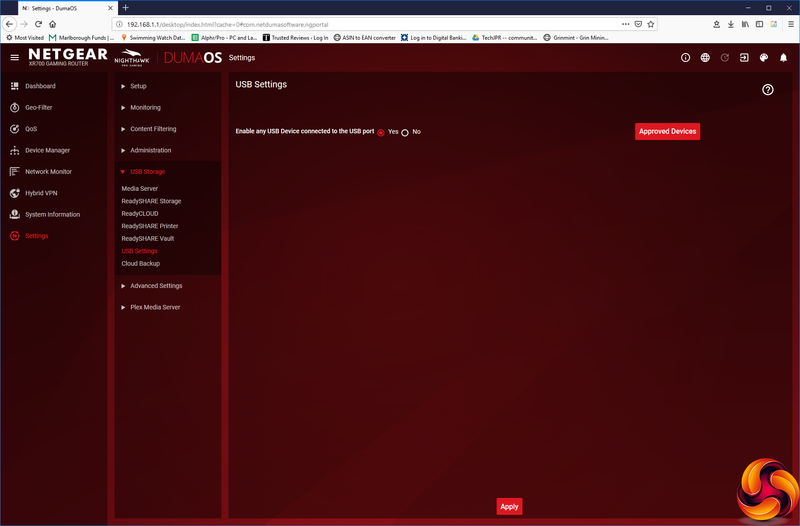 The USB Storage section is absolutely packed with options, and shouldn’t be called USB Storage because it also includes the ability to share a USB-connected printer. 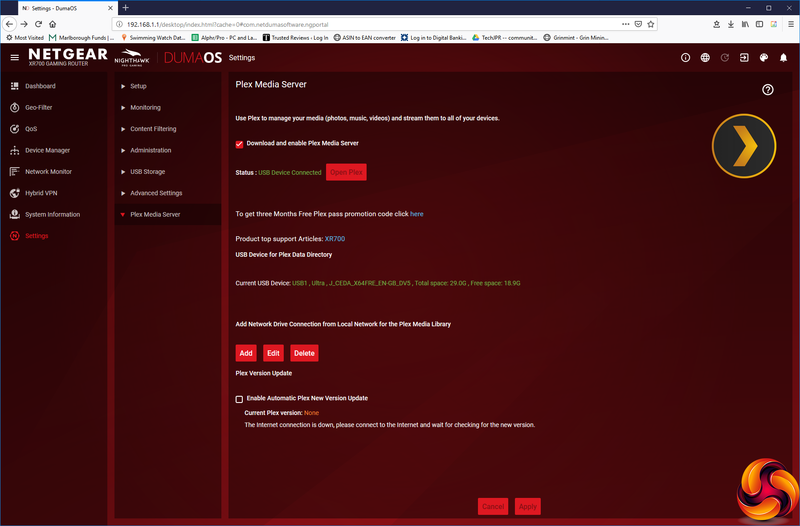 The built-in media server has built-in TiVo and iTunes support, although the latter is music only. 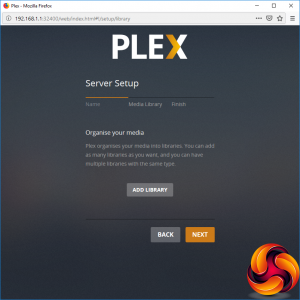 ReadySHARE Storage lets you share your USB-attached drive via Windows and Mac networking, HTTP, and FTP. 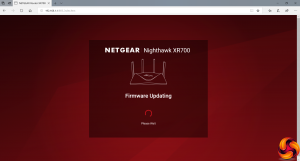 The ReadyCLOUD option exposes your local USB storage to the outside Internet via NETGEAR’s online service, whilst ReadySHARE Printer guides you through installing the NETGEAR client to access a printer attached to the router via USB over the network. 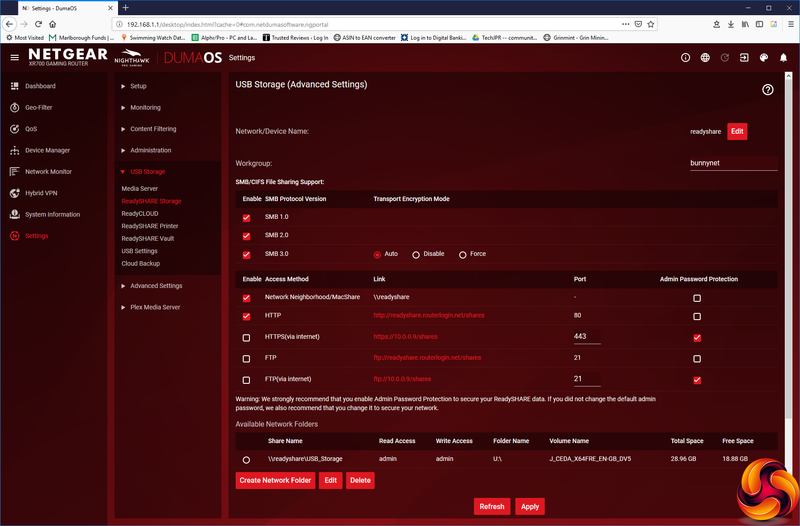 The ReadySHARE Vault similarly prompts you to install a client app to back up your systems to the XR700’s USB-attached storage. 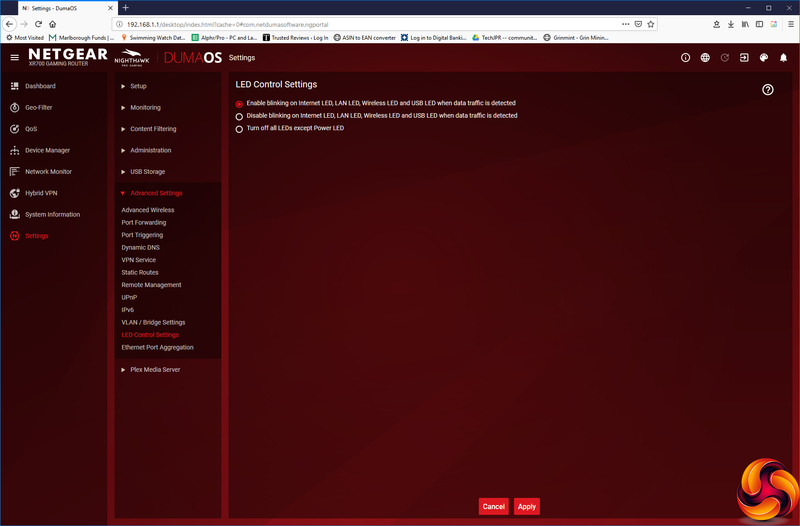 You can disable the USB ports altogether, or just allow approved devices to be attached. 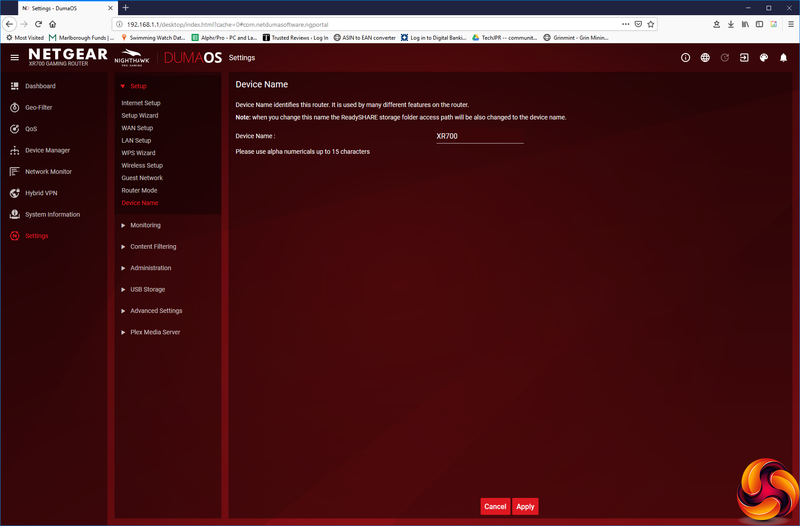 Finally, you can configure the XR700 to back up data from your USB-attached devices to an Amazon Drive Cloud account. 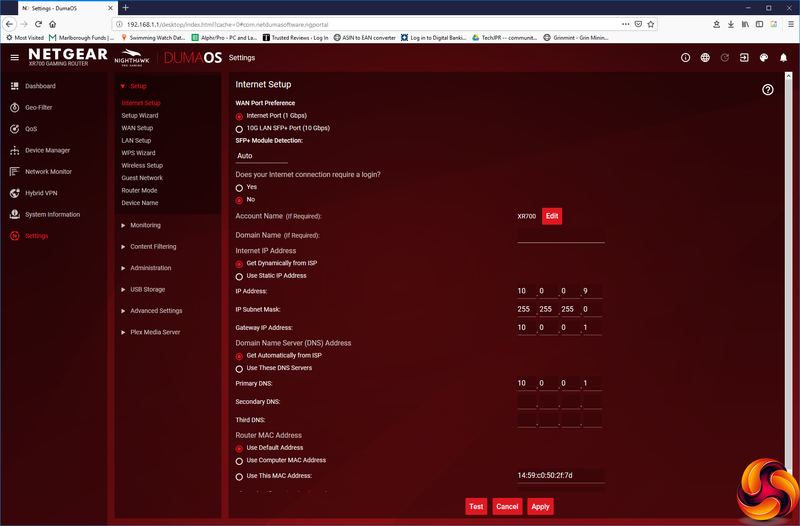 The Advanced Settings section is like another interface within the interface within DumaOS, like a Russian doll. 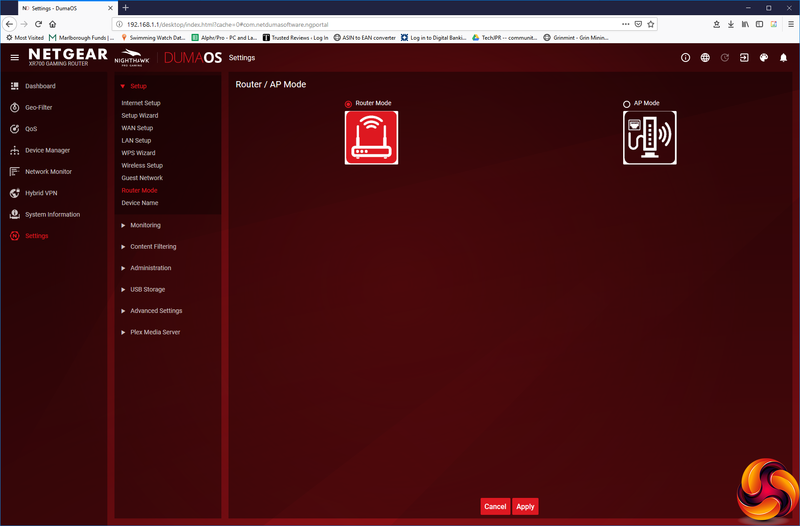 You get Advanced Wireless options, including the ability turn off individual wireless radios, enable 160MHz channels with the 5GHz radio (also called HT160), and enable Smart Roaming, where the WiFi will try to find the least congested channel to use dynamically. 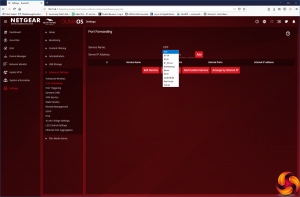 You can configure port forwarding to reveal certain applications to the outside Internet such as HTTP or FTP, although the list is a bit antiquated. 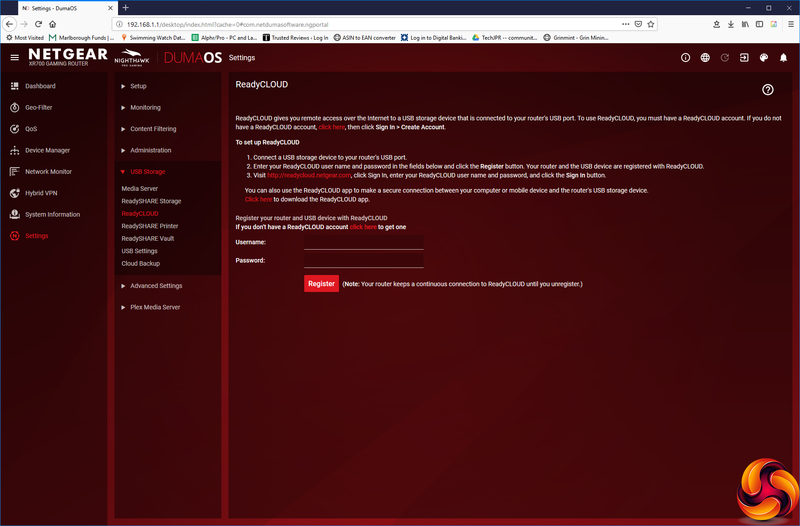 Does anybody still use RealAudio anymore? 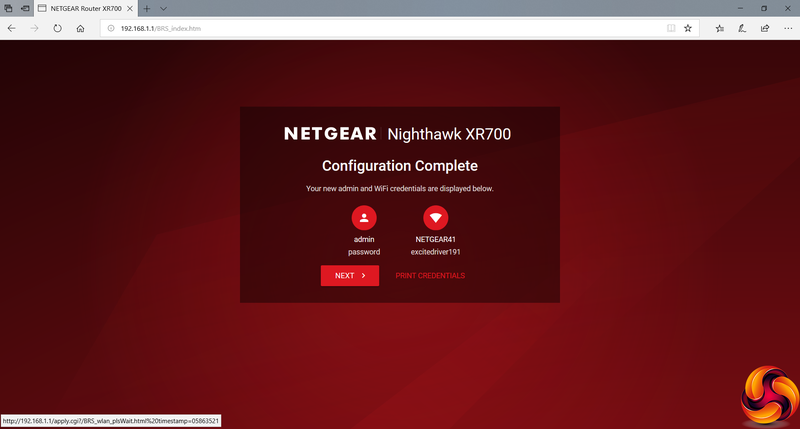 You can add details of a dynamic DNS service, although only NETGEAR’s own, No-IP and Dyn are supported. 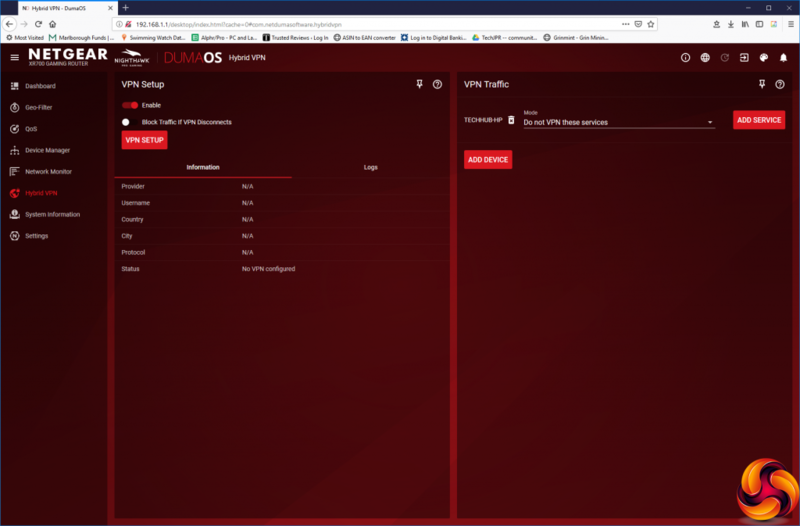 There’s regular support for creating a static VPN connection. 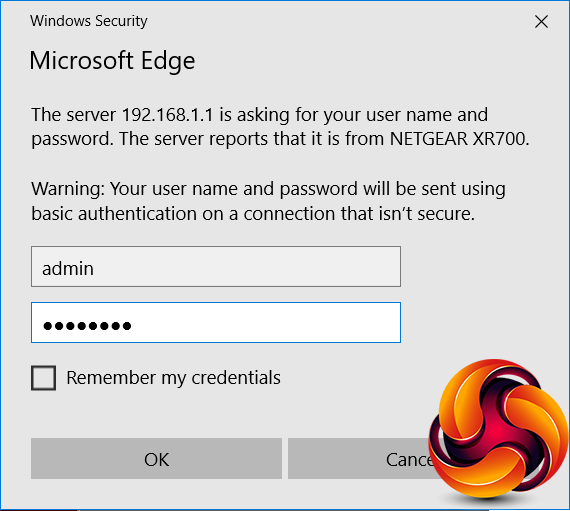 Only the OpenVPN protocol is available, but there are links to help you configure your Windows, Mac or smartphone VPN client. 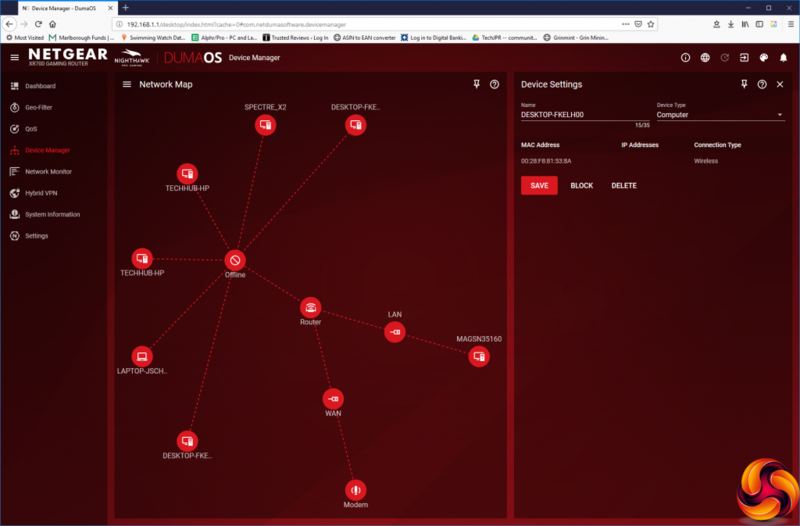 You can configure static routes, enable remote management, toggle UPnP and IPv6 support, and alter how the device LEDs behave. 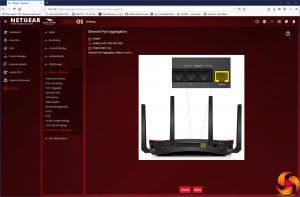 Finally, you can enable aggregation of LAN ports one and two, as discussed earlier in this review. 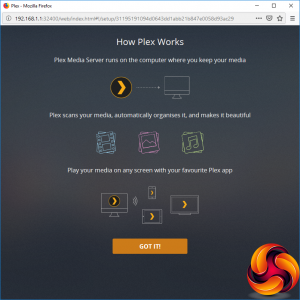 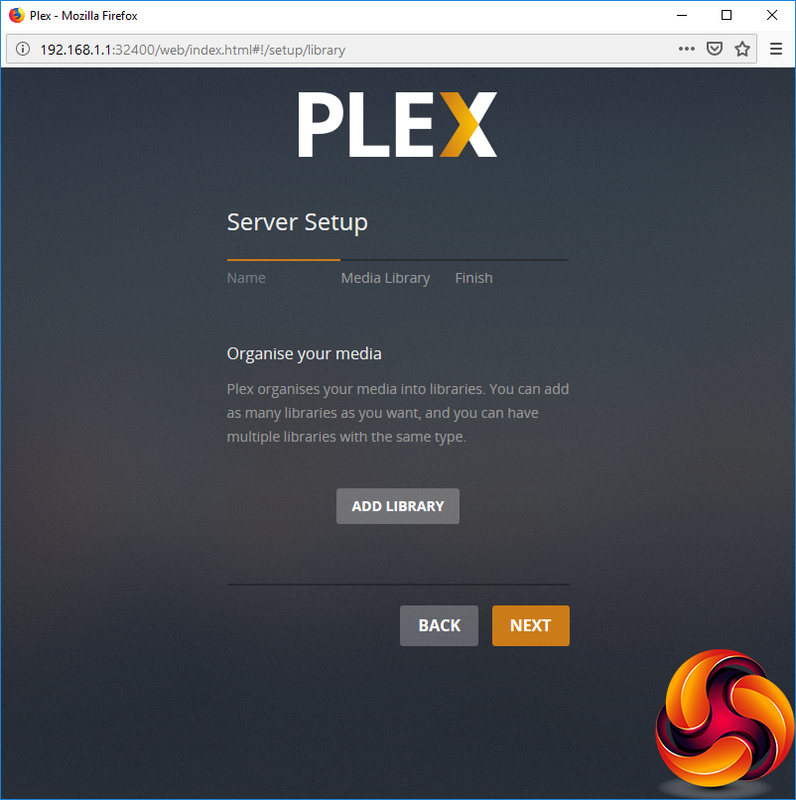 Last, but not least, there’s built-in support for the PLEX media server, However, you need to attach a USB storage device and download the software to this drive to enable the server. 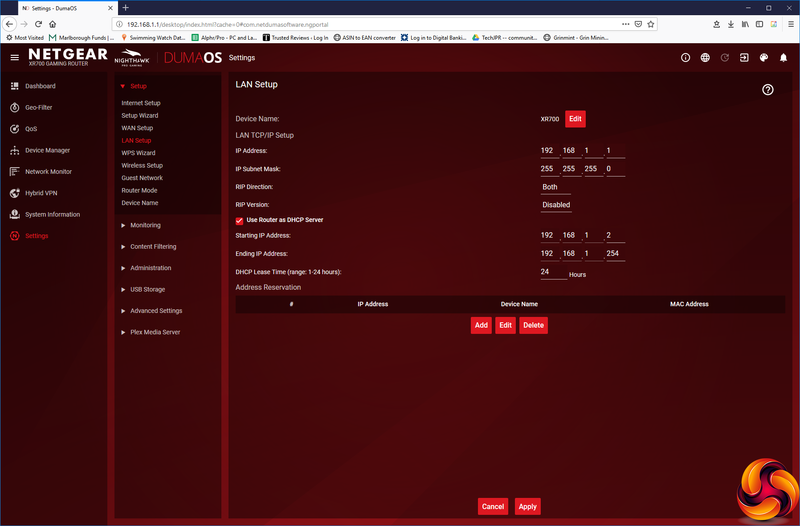 This is another feature that the XR500 doesn’t have. Overall, there is a staggering amount of functionality available in the XR700’s administration back end. You get a little more than the XR500, but not so much that the XR700 wins out clearly on software features. 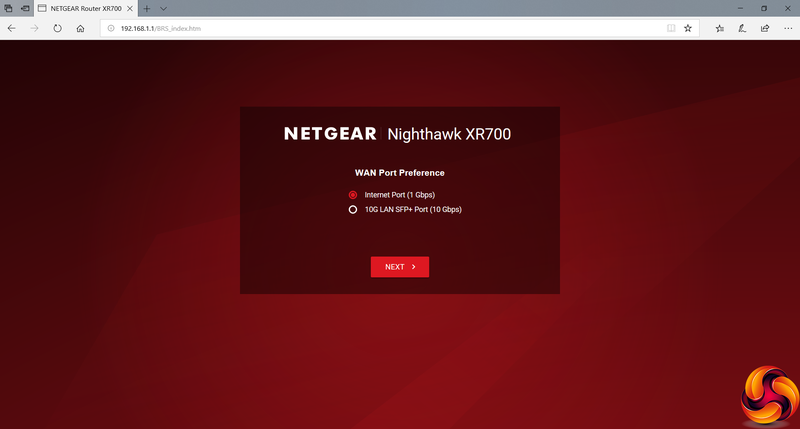 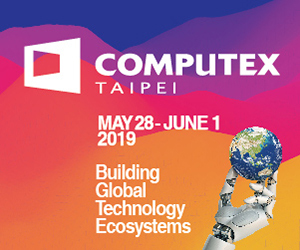 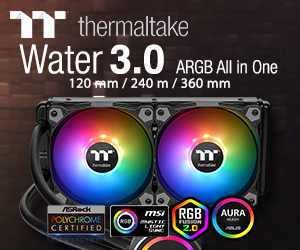 In order to warrant its high price, it needs to have the high-end performance to match its comprehensive software capabilities and software specification. 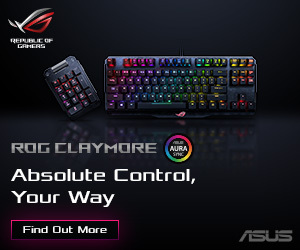 So let’s look at that aspect next.